Mrs. Fry (maiden name Gleisner, first name unknown) is the mother of Yancy Fry Jr. and Philip J. Fry who lived in a completely trashed house somewhere in Flatbush, Brooklyn. She loves sports more than her children, such as when she was giving birth to Philip, she cared more about a baseball game and was too busy playing golf when Yancy Fry Jr. was trying to steal his clover. She was also too excited about a football game to wonder where Philip had disappeared to. Mrs. Fry and Yancy Fry Sr. did not care about their son and thought sending him to school was a waste of tax money and did not bother much looking for him when he was frozen on New Year's Day, 2000. Despite this, Mrs. Fry truly loved her sons, as she admitted that she did miss Philip very much after he disappeared. [3ACV14] She once advised Fry that, regardless of how dumb or ugly he might be, what matters is that he is good-hearted, [6ACV05] which shows that she was far wiser than what her negligent antics suggested. 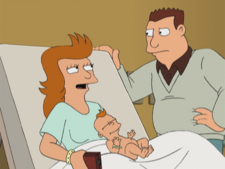 In the season-7 episode "Game of Tones", an examination of Fry's dreams reveals that despite her unorthodox parenting style and obsession with sports, Mrs. Fry was in truth a devoted and loving mother. Upon realizing that he will never be able to tell his Mother he loves her and is grateful, Fry suffers a deep personal crisis. At the end of the episode, Nibbler and the Nibblonians pay Fry back for all the suffering he has endured on their behalf by projecting him into Mrs. Fry's dreams in the 21st century, so he can speak to her one last time. Yancy Fry Sr.: So what should we name him? Mrs. Fry: You pick, I picked dinner last night. Yancy Fry Sr.: Well, I was thinking of Philip after those screwdrivers. Mrs. Fry: I'll never forget the day Philip disappeared. Wisconsin won the Rose Bowl 17-9. Mrs. Fry: [To Yancy Fry Jr..] Your brother may be missing, but his crap sure isn't. This page was last edited on 5 June 2017, at 08:29.